I tend to be a big picture thinker, and have always just assumed that the connections between organic agriculture and social justice were self-evident. Yet clearly many others don’t see this connection, and believe that with the advent of a federally mandated organic certification and marketing program, organic has lost its soul. 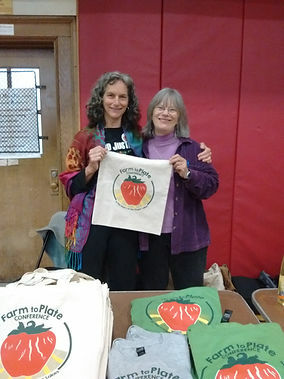 However, there was plenty of soul in evidence at last spring’s Farm to Plate Conference in Ithaca, NY. For the first time in my long history of attending such conferences, the key organizers and all four opening keynote speakers were passionate and articulate African American food and farm system activists. I sat and listened with tears welling in my eyes–even though looking around the room revealed only a sprinkling of black and brown faces in the audience. “How do you have justice on stolen land?” We have to build our own tables, not just be at the table. …”Food is a lens for shifting power.” We can’t just sit around and discuss ideas—farming allows us to transform the physical reality. Raj Patel, from his keynote talk, entitled Reparation Ecology: “The food system doesn’t just make food. It makes us.” The search for cheap money is a search for cheap nature…cheap work…cheap food…cheap care…cheap energy…cheap lives. A couple of days after my return from this inspirational event—reconnecting with some old friends like Joanna Green, one of Groundswell’s founders, as well as making new ones–I had the opportunity to attend a workshop called Teaming with Microbes here in Vermont, less than an hour from my home. For a day and a half we took a deep dive into soil microbiology and its practical applications, presented by two brilliant and passionate women, Nicole Masters and Didi Pershouse. The subject is one of my own central passions, one that drew me down the rabbit hole of organic certification to begin with. This event lacked the social diversity of the previous conference, more representative of the participants typically found at any of the organic farm or trade gatherings I have attended. The ironies of the juxtaposition of these two experiences has been bubbling through my conscious and subconscious mind ever since. This intensive workshop delighted me with more information about the crucial role played by fungi, particularly mycorrhizae, in creating soil health, and how they interact with plant roots and other organisms in the soil such as bacteria and protozoans. The critical importance of our complex interdependence with the microbial community in our soil and in our gut is only beginning to be appreciated by scientists and doctors. Among the dozen or so participants from all over the Northeast was another Vermont neighbor, Dave Chapman of Long Wind Farm. A respected grower and early participant in organic certification programs that I helped establish, Dave is well known as the ringleader of opposition to the USDA’s allowance of soil-less growing systems that are variously known as hydro-, aero-, aqua-, or bio-ponic to qualify for organic certification. He and I have had some public debates on line and in person about this controversy, in which he (and others) have proclaimed that such an allowance represents an attack on the very soul of organic. After my exhilarating experience in Ithaca, I really wasn’t too interested in arguing with privileged white guys about the soul of organic. Dave’s latest missive contains testimonials from a few all male, all white organic pioneers with whom I have had similar arguments about different aspects of organic regulations over the years. I felt like I was having flash-backs to the 1980’s, when I experienced a certain condescension from the “real farmers” when arguing about the value of organic certification. Now some of the same guys want to make organic great again. 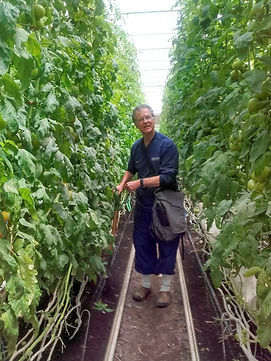 The second morning’s field work on soil monitoring at Cedar Circle Farm in Thetford, VT included a visit to neighboring Long Wind Farm, where Dave grows his luscious certified organic tomatoes year round in heated glass greenhouses. The plants are rooted in soil heavily dosed with farm-produced compost made with manure from large organic chicken farms and bare of vegetative cover. Although he is experimenting with removing the greenhouse soil between plantings so he can grow cover crops on it outdoors before replacing it the following year, I wondered how he was meeting the organic requirement that annual crops must include a rotation plan. It didn’t seem like there could be much biodiversity involved in this capital and energy intensive production system, microbe-rich compost and a couple of mullein plants plopped at the end of the tomato rows notwithstanding. Arguably superior to the bioponic monocultures he decries, but not to my eyes a significantly different approach to tomato production. Despite the rhetoric of self-righteous indignation, what I observed served to convince me that this crusade is at least as much about limiting market competition as it is about organic principles—though not, I would hasten to add, deliberately so. When I think about supporting more soul in the organic movement, what inspires me are the people I met in Ithaca a couple of weeks ago, who are building community gardens and urban farms (some featuring aquaponic systems), reviving the agricultural heritage of their enslaved forebears, advocating for a living wage for farm and food system workers, and demanding food justice–or just plain justice–for all. This is the kind of activism that can ultimately prevail against the corporate agri-chemical-industrial model that is destroying our health and our planet. What can we do to alleviate the unbearable whiteness of organic? How can we work to make healthy, living food that is our human birthright—and access to land and tools to produce it– available to all people? That is one question that I see as central to furthering the true organic vision. There are certainly gaps in the USDA organic system, as has been explored recently in the press. Concluding that such flaws prove that the USDA organic label is meaningless or corrupt—or perhaps has lost its soul–as some would have us believe, will not solve the problem that is inherent in our market-based food system. As we continue working to enhance the regenerative capacity of our soil, there is still no better consciousness raising tool than that little green and white label that lets everyone know that there is something fundamentally wrong with the other 95% of our food system. That’s a good starting point to finding more ways to make it better.